There are many advantages to exploring a country on a bike. You never have to travel indoors, you get to see a lot more of the countryside than a regular tourist does, you get to set your own itinerary and your own plan and it costs next to nothing. What more could you ask for? Adventurous types have been cycling through the south of France for decades and they always return with gushing praise for the excellent state of the region’s cycle lanes, roads and trails. France might be well known for its wine and its food, but it’s also famous for the superb way in which it treats its cyclists, says Telegraph journalist Adam Ruck. There are thousands of pristine cycle tracks and roads throughout the south of France and they’re all rigorously looked after and maintained. It is rare to find a part of this region that isn’t traversable by bike. So, if you’re an energetic person who loves to travel by bike, you should try staying in France with Cheznous and taking your bike. You can’t find anywhere better than the south of France for cycling based exploits. Here’s a guide to some of the places that you can stop off at during your big French adventure. The small province of Avignon is ringed by 800 year old stone ramparts. It is filled to the brim with magnificent architecture, art and museums, with the crown jewel of the region being the papal palace Palais des Papes. Just outside the city is a breathtaking Roman aqueduct named the Pont du Gard. If you don’t stop off and see any other attractions whilst you’re cycling through Avingnon – just make sure that there’s time for these two awe inspiring sights. Most of the cycle trails in this region cut through or past local vineyards, so the scenery is always fantastic, says Simon Calder from the Independent. Why not stop off at the intoxicating village of Châteauneuf-du-Pape and sample its famous wine? France’s famous walled city is a great place to spend the night, so when you get tired of being on the bike and fancy a break – check yourself into a Carcassonne hotel. Make time to explore this elegant walled city and its ancient fortifications because there’s nothing else quite like it in Europe. You won’t believe how beautiful it looks at night when the outside walls are all lit up, says ThereAndBackAgainTravel.com. Plus, you don’t have to stay off the bike for very long if you don’t want to. The countryside around Carcassonne is just as beautiful and it’s a great region to cycle through. Keep your eye out for wild heather and lavender and if your bike has a basket – why not be a bit clichéd and fill it up with flowers? 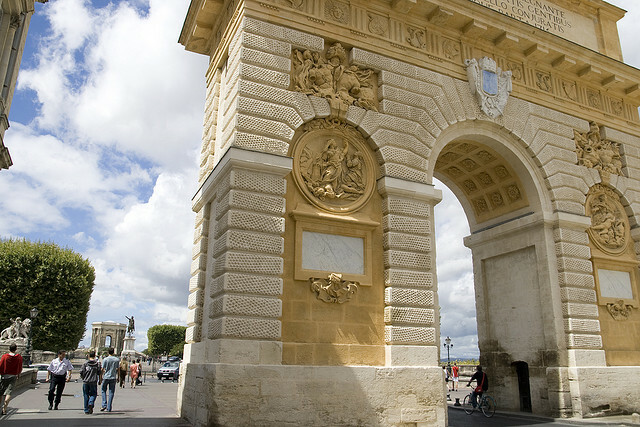 Montpellier is a fairly large city in the Languedoc department of France. It’s a cultural mish-mash, really – it has a lot of wonderful architecture, plenty of museums and a lot of relaxed bars and cafes, but it also has its fair share of trendy restaurants and nightclubs. The burgeoning student population here has slowly changed the look of the city, but it’s still an excellent place to visit and to cycle through. The area is extremely bike friendly, with hundreds of miles of excellently maintained cycle paths and trails. There really isn’t anywhere you can’t go on a bike in this region – if you get into any trouble or need any help there are plenty of cycle stations positioned along the main roads.